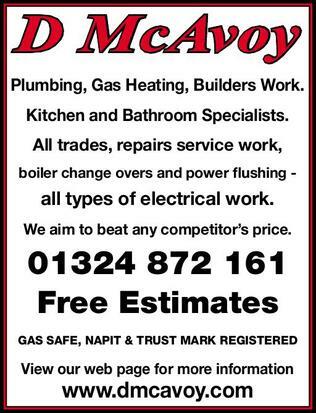 Derek McAvoy Plumbing & Heating Services are a family owned business operating in Falkirk for over 30 years, with a wealth of experience in a wide range of plumbing and heating services, including bolier and central heating installation, repair and servicing, kitchen and bathroom installation and everything electrical. 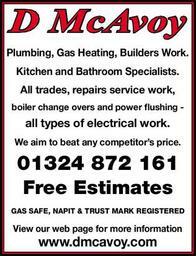 We also cater for all trades with no job too big or small, and we guarantee a professional and first class, reliable service, with competitive and affordable prices. Free no obligation estimates provided and all work comes with a comprehensive guarantee for your peace of mind. Gas safe, NAPIT & Trust Mark registered.